Student plays on a violin from World War I! The Boswells School Orchestra performed in front of a packed Chelmsford Cathedral audience to mark 100 years since the end of World War I. This was in collaboration with Girls County High, Hylands, Sandon, Great Baddow, Essex Music Service, City of London Sinfonia and acclaimed composer John K Miles. The Students helped John compose the music for what was a truly memorable original composition of ‘The Violin’. 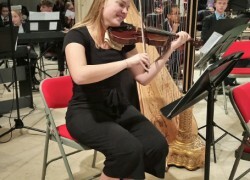 Most notably, Boswells own Iris Heij was selected to perform on WWI soldier, Private Burchell’s violin, which survived trench warfare to this day! The students were a credit to themselves and it was truly a beautiful performance.